NEW YORK- Gay Pride Week began with a rainy start last weekend. 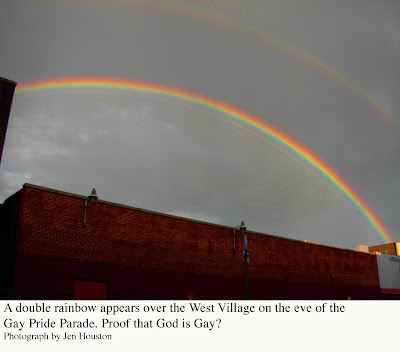 Our conservative columnist, Irwin Kram cited this as proof of God's displeasure with homosexuals, and predicted that the rain would continue through today's climactic parade. Click here to see his comments. Instead, today is proving to be one of the few sunny days New York has had in the past few months. On top of that, Gay Pride celebrators witnessed a gigantic double rainbow over the West Village on the eve of the parade. Several theologians have taken the rainbow as evidence that God Himself is gay. Other evidence includes His Old Testament obsession with men's penises, the fact that He is continually pictured surrounded by scantily clad male angels with long beautiful hair, and the fact that in 14 billion years, there has never been a Mrs. God. The Inquisition puts the question to question to you, our readers. Do you believe God is Gay, and why? Please post your comments below. LOS ANGELES - The news of pop culture icon, Farrah Fawcett's death left the nation shocked and saddened today, until later in the day when the news of eccentric international megastar, Michael Jackson's death completely overshadowed it. "This is so irritating," says Fawcett fan, Jenna Matthews. "We were going to have a candlelight vigil in the park, until a few hundred Michael mourners showed up with their own candlelight vigil." "Don't even get me started," says Mike Ellworth, president of the Ed McMahon Fan Club. WASHINGTON DC- As pundits debate how best to respond to the tumult in Iran, one thing is clear: it is all President Obama's fault. In a Fox News interview yesterday, John McCain, the former presidential candidate, best remembered for his savvy international diplomacy and his hit single, "Bomb Iran," blamed the president's "timid and passive" stance for the current situation. In the Weekly Standard, William Kristol and Stephen Hayes called Obama a "de facto ally of President Mahmud Ahmadinejadi." A report from the American Truth Foundation, demonstrates how the president's Iran position is part of a pattern of failing to take action at moments of international crisis. "Obama is showing the same lax, dictator-coddling attitude now that he did when the Iranian theocracy first came to power in 1979," Foundation spokesperson, Mitchell Willburn says. During the Iranian revolution, the eighteen-year-old future president was quoted as saying, "yeah, whatever," which was widely regarded as an endorsement of the Ayatollah's regime. According to the Foundation's report, Obama showed a similar lack of conviction as a seven-year-old when the Soviets invaded Czechoslovakia. In 1962, during the Cuban Missile Crisis, the one-year-old Obama's public statements were downright unintelligible. "By contrast," Willburn points out, "John McCain, who was seventy-four at the time, endorsed a decisive strategy of nuclear assault." While it is clear that President Obama is not doing enough to aid Iranian democracy, it is equally clear that he is doing way, way too much. An array of conservative foreign policy experts, including former Secretary of State Henry Kissinger, and former National Security Advisor Brent Scowcraft have spoken out against speaking out in support of the demonstrators, claiming that it will only strengthen Ahmadinejad. Though the conservative position may appear contradictory, Willburn explains that nothing could be further from the truth. "If we advocate tougher rhetoric one day and smoother diplomacy the next, liberals may see a contradiction because they don't realize that we are focused on principles, not political positions. Our core belief is that Obama is always wrong, and no matter what he does, that's not going to change." CUPERTINO, CA- News broke this weekend that Apple CEO, Steve Jobs, received a liver transplant in April. His new "iLiver" is sleek, white, and holds over 80 GB of bile. There is already a ten month waiting list for the new device, however it is reported that the super-rich can bypass the list to get hold of the trendy new organ right away. Opponents of healthcare reform are citing Jobs's transplant as proof that an overhaul of the American medical system would be a grave error. "Our country has the greatest healthcare in the world for the super-rich," says Mitchell Willburn of the American Truth Foundation. "But if big government starts meddling with it, pretty soon our super-rich won't get any better treatment than the super-rich of Canada or France." Willburn even warns of a "nightmare scenario," where the quality of care the super-rich receive declines to the level of care that uninsured Americans currently get. If this were to happen, we might even lose our super-rich to more plutocrat-friendly nations, a misfortune that would hit the uninsured the hardest. "Millions of American paparazzi would lose their jobs," Willburn says, "and the working poor would be stuck watching shows like The Real Housewives of Macau for their escapist entertainment. That would be a dark fate indeed." NEW YORK - Gay Pride Week got off to a rainy start this weekend. Irwin Kram, of the conservative think tank, the American Truth Foundation, offers his own explanation of the weather in his video blog. WASHINGTON DC- Attorney General Eric Holder testified before the Senate this week on the state of the Obama administration's efforts to close the Guantanamo Bay prison. Republican Sen. Sam Brownback has been leading a Senate attempt to bar the transfer of detainees to the US, claiming that these suspected terrorists are too dangerous to hold in American prisons, and that they are particulary unfit to be held in Leavenworth, in his home state of Kansas. Many felons currently serving time in Leavenworth have taken offense at the implication that they are somehow less dangerous than the Guantanamo detainees. "You want to talk dangerous?" asks convicted mafia enforcer, Tony Gambolini. "You hear what happened to Bobby Two-Fingers? Not that I had anything to do with it, but someone chopped that little rat up and fed him to his dog. And that's just one of a dozen jobs I had nothing to do with." Gambolini is skeptical that an incarcerated terrorist would pose a greater threat to society than he does. "What's he going to do in an eight by twelve cell that I can't do? F---ing explode? Give me a break. And we're talking guys who haven't even been convicted of anything yet." John David Knowles, aka the Witchita Cannibal, is equally offended. "Really?" he asks. "Really? The detainees are so much more evil than I am? Did any of them build an entertainment center out of severed human heads? Somehow I doubt it." Not all inmates are displeased with Sen. Brownback's stance. Burt Grover, a white-collar criminal who was in the process of being gang raped at the time of interview, says he's pleased the detainees won't be coming to Leavenworth. "I don't know if I'd feel safe if they were here," he says. "Because my crime wasn't serious, the judge let me pick my own prison. Security's always been important to me, so I chose a maximum security facility. I'd hate to think I made a mistake," adding "Hey, are you guys ever going to finish?" Sen. Brownback assures American convicts he means no offense. "It's just that these terrorists are so special, I don't know if a conventional prison can hold them." Some senators have proposed placing the detainees in harder to escape scenarios, such as trapping them behind a group of fat tourists in Times Square, or locking them in a conversation with the IT guy at your company Christmas party, but until a real solution is agreed upon, the detainees must remain where they are. BROOKLYN, NY- Protesters gathered on Sunday at the Holocaust Memorial Park, condemning a plan to add stones commemorating gays, gypsies, Jehovah's Witnesses, the disabled, and political prisoners who died in Nazi death camps. The move to block the new markers is led by State Assemblyman Dov Hikind, who claims that recognizing non-Jewish victims "dilutes" the meaning of the memorial. "Hikind is right," says Jon Flatow, one of the protesters. "The only way to honor the victims of the greatest act of racial hatred in history is to keep this memorial 100% racially pure." Sam Fried, another protester concurs. "We can never again allow an entire class of people to be vilified," adding "unless they're gay. Or gypsies. And if you're a gay gypsy, forget it." The protest left many members of the knee-jerk liberal community feeling conflicted. "I always side with both gays and Jews," says Rick Wilson, an NYU senior, "so I don't know what to do here. And as for gypsies, I saw Drag Me to Hell this weekend so there's no way I'm going to mess with them." A compromise plan has been offered, in which the gay and gypsy stones would be commissioned, but would be relocated to a special containment area. For more coverage, follow this link to the Jewish Daily Forward. NEW YORK- Sensitive to the needs of budget conscious consumers, Armani Exchange's new line contains no actual clothing. "We recognize that these days, even the simplest textiles are beyond the reach of many of our customers," a spokesperson says. The new "A|X Nothing," pictured here, is a one-size-fits-all, unisex, no-piece outfit, starting at just $40. Yesterday, Kansas abortion doctor George Tiller was shot to death while serving as an usher in his church. Click here to read the CNN.com story. As a senior fellow at the conservative think tank, the American Truth Foundation, I have been an outspoken opponent of abortion, but even I will admit that the act of shooting a man in church poses a deep philosophical problem. On the one hand, you don't want to go to church without your Bible. On the other, you don't want something else in your hands that can interfere with your aim. That's why I'm happy to introduce the Ezekiel 2517. 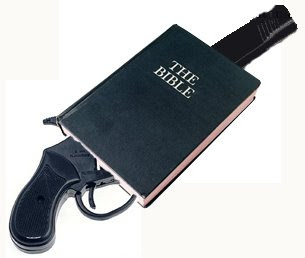 It's a Bible and a gun. This dual use device was invented by a conservative biblical scholar who discovered that if you cut out all the Bible's annoying references to showing compassion, not judging people, and loving your enemies, there's enough room left over to fit an entire semiautomatic weapon. And with an easy to use dictionary concordance/spare cartridge holder, it takes just seconds to reload and/or find the perfect passage to justify your assault. If Jesus had access to this sort of weapon, he wouldn't have been the Prince of Peace, he would have been the Prince of the Concealed Piece, and when the high priest struck him across the face, instead of turning the other cheek, he would have pulled out this gun and said, "Eat lead, motherf--ker!" Not only would he have been spared the crucifixion, but The Passion of the Christ would have been a way more exciting action movie. Unfortunately, we can be sure that the liberal elite will do everything they can to block the sale of this new invention. They hate guns almost as much as they hate Bibles. And with the Obama administration attempting to force a radical judicial activist onto the Supreme Court, our freedoms and values are more in jeopardy than ever. If Sotomayor does manage to get confirmed, we can only hope Chief Justice Roberts has one of these babies handy when it comes time to "swear her in."